Celtic designs on Pure Silk Shawls and Scarves, hand painted wearable art. Celtic Art reflects 2,700 years of rich Celtic history and culture. For your Celtic Wedding what could be more appropriate than the Long Celtic Wedding Shawls featuring a range of Celtic designs by Jack Brilliant. The long Celtic scarves are the perfect gift for bridesmaids and special guests. 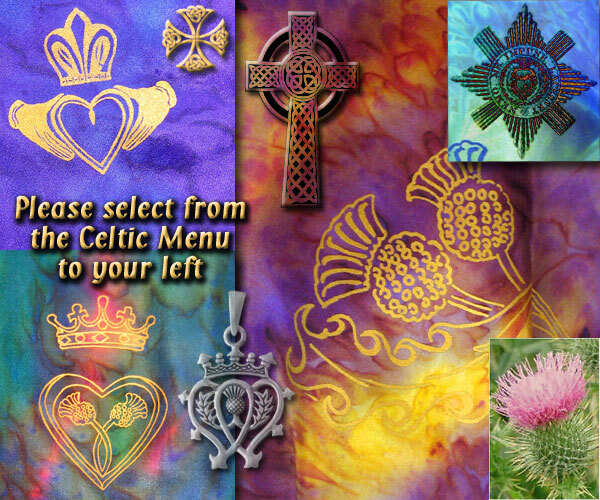 For our Irish Celts the Claddagh designs are the obvious choice. The Luckenbooth, Royal Thistle and Wild Highland Thistle designs will appeal to our Scots Celts.